This statement centrepiece is so easy to make. Pick a festive colour scheme and you’re away! 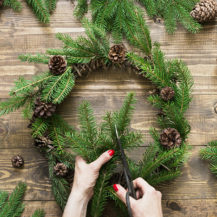 You will need: A ring of oasis with a tray, Christmas tree offcuts, a variety of foliage, fresh flowers, berries, a hurricane lamp and a candle. Step 1: Fill the sink with water and soak the oasis ring until it turns dark green, then place in its tray. Step 2: Push the tree offcuts into the oasis, leaving a space for the lamp. Step 3: Next, push in the berries and green foliage – we used blue pines (berried tree ivy is great; holly is prickly). 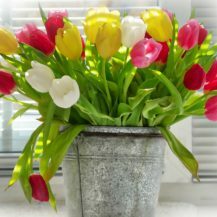 Distribute fresh flowers between the foliage. There’s a wonderful choice of realistic garlands around. 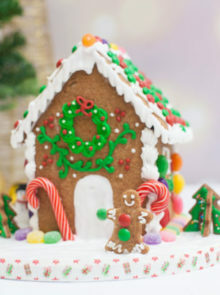 Layer them up, then simply add your own decorations to it. You will need: One or 2 garlands, battery lights, ribbon, baubles and fake flowers. Step 1: Start with your base garland and wind it up the banister. Secure it with florist’s wire (available from nursery shops). Step 2: Do the same with the next garland, but make sure it’s slightly smaller and a different texture to add contrast. Step 3: Then thread lights through; small battery ones are best – tuck the battery packs in where they can’t be seen. We used fabric roses that simply clip on. 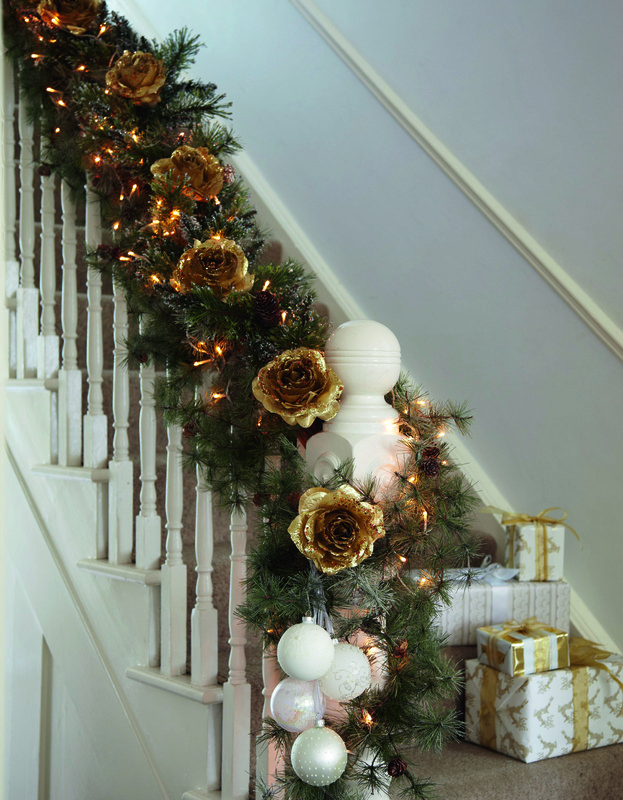 Finish off with a group of baubles in matching colours hanging from the newel post. 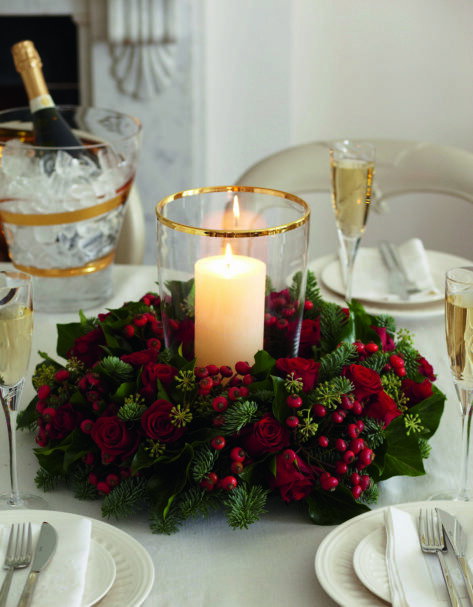 Choose long stems to quickly build up an eye-catching floral arrangement for the dining area or main lounge. 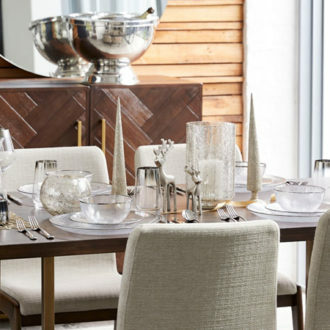 You will need: Your largest vase, some bubble wrap or packing material, silver branches, berry branches and anything else that takes your fancy. You can choose to use real or fake, or a mixture. Step 1: Pack the bottom of the vase with bubble wrap to raise the bottom, so that you get more height. Step 2: Position the silver branches around the back, gently teasing and bending the branches apart, as they will have compacted in their wrapping. Step 3: Pop frosted berry branches in front, bending them outwards, too. 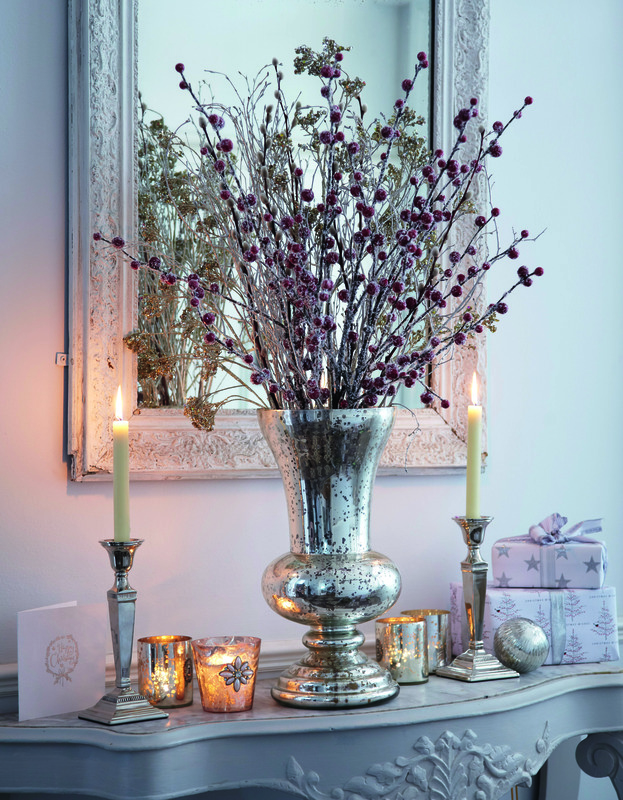 Then add sparkly branches for an opulent touch. Step 4: Surround the vase with pretty votive holders and candlesticks, then complete the look with wrapped presents, sparkly baubles and some Christmas cards.